Note: Broke his maiden at Laurel in his 2nd start last year by 16 lengths, but was disqualified to 4th. 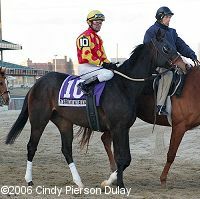 Won again by almost 8 lengths at Aqueduct in his next start then won the Miracle Wood Stakes at Laurel by 10 lengths. Came to Aqueduct for the Gotham and was third by only a length behind Like Now and Keyed Entry. Stalked pacesetter Mister Triester then exploded in the stretch to win by over 9 lengths. Made a small move in the Kentucky Derby to get up to 4th in the stretch, but faded to 7th by the finish. Chased Like Now early in the Preakness and still finished second by a large margin.